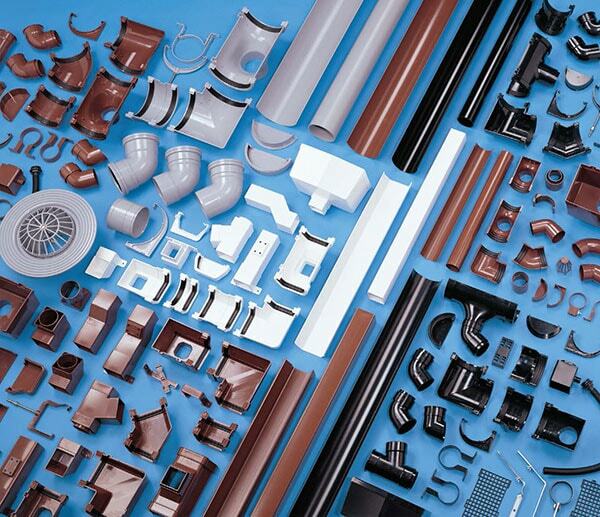 JDP stock several styles of rainwater system including “Cast Style” with various capacities to suit any application. Manufactured in uPVC they offer the correct profile to complement any domestic property. Being made from uPVC they are low maintenance and are produced in a range of colours. *Figures quoted above are worst case scenarios, flow capacity is dependent on the position of the outlet. For advice please ask your local JDP branch. BS EN607: 2004, BS NE 12200-1:2000, BS NE 1462: 2004. Position the gutter outlet vertically above the drain inlet or gully from which the rainwater will be conveyed to the underground drainage system. Fix the outlet in position on the fascia allowing for whatever fall, if any, is required. Fix the gutter support bracket furthest from the outlet at a position on the fascia which will produce a run of gutter either horizontal or to the desired fall. Stretch a line taut between the fixed outlet and support bracket, establishing a straight gutter line. Fix the remainder of the fittings to the fascia following this line, a joint bracket being positioned at each junction of two gutter sections. Where, due to the absence of a fascia or the design of the building, support fittings cannot be fixed, the rafter top bracket and side bracket provide alternatives. Rise and fall brackets driven into the wall will support the gutter system where there is no fascia and rafter brackets are impractical. Position these against alternate sides of joint brackets, running outlets or angles along the installation to prevent excessive thermal movement in any one direction.